John Ramshaw is ruling nothing out as far as the remainder of Kettering Town’s season is concerned after they returned to action with a fine 4-0 victory at Stratford Town. 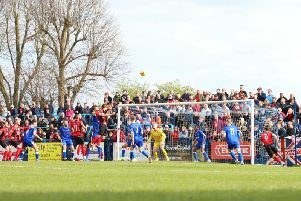 Brett Solkhon’s first-half penalty was followed by goals from Michael Richens, Mathew Stevens and Aaron O’Connor after the break as the Poppies stayed firmly on course for a play-off place in the Evo-Stik South League Premier. The victory means Kettering are now 11 points clear of sixth-placed Chesham United while the Poppies remain five behind third-placed Weymouth with three games in hand. The top two of Hereford and King’s Lynn Town have pulled away from the rest but head coach Ramshaw insists the Poppies have it all to play for in the final stages of the campaign. And he thoroughly impressed with a “professional performance” at Stratford. “You know me, I am very much a person who doesn’t believe anything is done until the fat lady sings,” Ramshaw said. “I am not taking a play-off place for granted and I am also not ruling us out from finishing higher in the table than our current position. “Football is a funny game, anything could happen over the next six weeks so we just have to take it one game at a time and whatever happens at the end of the season will be what we were destined for. “It was Arctic conditions at Stratford with a gale force wind blowing straight down the pitch and we were playing into it in the first half. “But I was really impressed with the way the players dug in and ground out that first half. “We made Stratford play in front of us and we ended up creating the better chances and also getting the goal as well. “We wanted to make sure we got through that first half and then we really did smash the second half. We upped the ante and took the game away from them. Midfielder Richens marked his return to the starting line-up with the pick of the goals - a 30-yard strike into the top corner - while fellow midfielder Ben Milnes made a surprise return from an ankle injury as a late substitute. And Ramshaw added: “It’s great to have Michael back and he scored a wonderful goal with his left foot from 30 yards into the top corner. “It’s a massive boost for us that he is back in the side and it was good to see Ben Milnes have a cameo appearance towards the end. The Poppies are due to be back in action on Tuesday night when they host Royston Town at Latimer Park.